2018 High-Level Political Forum: Global Circus or Lever for Feminist Peace? In 2015, the world’s governments adopted the Sustainable Development Goals (SDGs), a universal “2030 Agenda”, which has the potential to address the conflict prevention gap and move from political economies of war to political economies of peace and gender justice. Three years after the SDGs were adopted, there are more opportunities for an integrated approach that addresses root causes than ever before. Yet on the big issues, we are going backward: this year the SDGs review took place just a week after the US President called for NATO members to double their military spending, and a just couple weeks before the day global consumption outpaces the regenerative reproduction capacity of our planet. This is not the world we want. As part of our work to strengthen holistic action that implements the SDGs for transformative action on disarmament, gender equality and peace, and mobilise awareness about the importance of local women’s peace work, WILPF engaged around the 9 to 18 July 2018 High-Level Political Forum (HLPF). We monitored the Forum around gender, peace and means of implementation issues, launched the #WomenLead2030 Campaign, and worked with our coalition Women’s Major Group to push for the implementation of the SDGs to work for women in conflict. Now, the Forum is over! It is time to assess progress on building societies capable of sustainable development and peace. Addressing systemic barriers is particularly important, since the 2019 HLPF will review SDG 16 on peace, as well as be the first Quadrennial review of the HLPF process. WHAT HAPPENED AT THE HLPF? The 2018 HLPF convened under a theme “Transformation Towards Sustainable and Resilient Societies”. It focused on reviewing SDG priority goals on water (Goal 6), energy (Goal 7), cities (Goal 11), responsible consumption (Goal 12), forests (Goal 15), and partnerships/means of implementation (Goal 17). As part of this, the HLPF included an opening segment, discussion reviewing each goal, and thematic reviews, as well as over a hundred of side events. Thematic discussions targeted issues such as building resilience, policy coherence, data and innovation for the SDGs. Side events addressed such issues as gender and energy, drought and migration, rights and meaningful participation and defending Human Rights Defenders (HRDs). 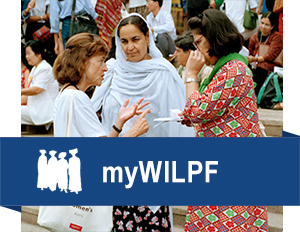 WILPF monitored the HLPF with a focus on gender, peace and means of implementation and mapped opportunities for strengthening the preparation and action ahead of 2019. WILPF launched our #WomenLead2030 campaign to bring attention to the invisible work that women do every day for peace, nonviolence, and justice. Building on this, we contributed to the TAP Network consultations for the SDG Accountability Handbook to share good practices from WILPF on engaging media, advocating for gender-sensitive national policies, ensuring accountability for arms transfers and corporate militarisation, as well as building movements for peace. With our coalition, the Women’s Major Group, WILPF worked to ensure that the 2018 HLPF Ministerial Declaration recognised that sustainable development cannot be realised without peace and security and that peace and security will be at risk without sustainable development. We supported Women’s Major Group statements in the official programme, as well as advocacy materials. Our messaging addressed current spending patterns on privatisation, militarisation and arms trade, as well as conditionalities linked to funding provided by international financial institutions (IFIs), to mobilise action to #MoveTheMoney from war and violence towards the realisation of human rights and gender equality. The HLPF concluded by adopting a negotiated ministerial declaration. This reaffirms member state commitment to realising the 2030 Agenda and leaving no one behind, and raises key issues to be considered in the 2019 HLPF modalities review. As part of this, the 2018 HLPF Ministerial Declaration recognises the interlinkages between peace and sustainable development and affirms peaceful, just and inclusive societies based on respect for human rights is necessary for sustainable development (para. 12). It calls upon Member States and relevant stakeholders to redouble efforts to resolve or prevent conflict and to support post-conflict countries, including by ensuring that women have a role in peacebuilding and state-building. While Russia called for a vote on the paragraph affirming gender equality, Canada led cross-regional affirmation of its inclusion and the declaration retained this commitment to gender equality and reinforcing the linkages between SDG 5 and the other SDGs. However, the Ministerial Declaration still had gaps on the importance of engaging with civil society, defending defenders, and as well as concrete action to address structural gaps for implementation and accountability. The 2018 High-Level Political Forum has demonstrated that the 2030 Agenda provides a unique space to bring diverse constituencies together and mobilise action that creates a new kind of economic development that promotes women’s human rights and protects the environment. However, as the Women’s Major Group has noted, HLPF discussions today seem more like a circus where poor countries beg for funding from donors. This must not continue. Realising the transformative intent of the SDGs requires recognising that people are not just left behind by accident: They are excluded as a matter of design. This exclusion is due to policies and priorities that prioritise patriarchal power over people and planet. To improve people lives, we need to disarm violence, invest in gender justice, and build economies and political governance for feminist peace. Check the Activist Toolkit for the HLPF that we put together to mobilise recognition of local women’s work and strengthen action that implements the SDGs.